Seats 4 - 6 people comfortably. 5' long x 30" wide. 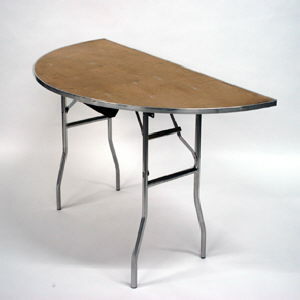 *Can be placed at the end of 2 6'ft or 8'ft banquet tables to form a large oval table. * Please call us for any questions on our half round 60 inch table in St Petersburg FL, serving Clearwater, Gulfport, Pinellas Park and the Tampa Bay Area.